It seems as though my blog has little to no activity so I have upgraded to a page on Facebook. 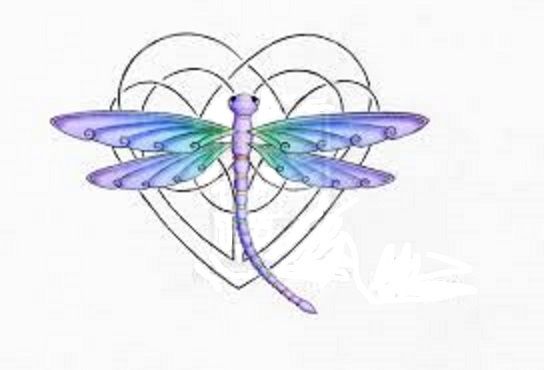 Please like “Dragonfly Dreamweaver” on Facebook and you will see all my recent work and accomplishments! This entry was posted in Uncategorized on January 29, 2016 by dragonflydreamweaver. Imagine yourself in Egypt at the time of the Pharaohs. Couldn’t you just see yourself wearing this to a dinner at the palace? The turquoise like stones are surrounded by tiny gold beads giving the illusion of grandeur. A small crystal sets off the black metal feathers portraying wings and flights of fancy. The set includes tiny wings for your ears. 19 inches in length. This entry was posted in Uncategorized on November 18, 2015 by dragonflydreamweaver. This cute little fella adorns a pouch of auburn deer hide. Its soft and luxurious feeling. Perfect gift for someone. This entry was posted in Uncategorized on November 16, 2015 by dragonflydreamweaver. This beautiful double pointed crystal has dual use. 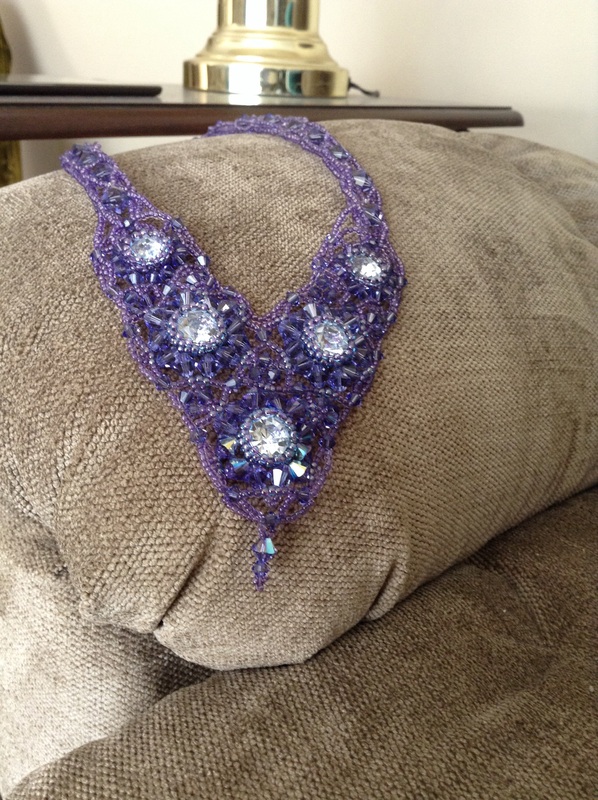 It can be worn as a necklace or detached to carry in your pocket or use in energy work. 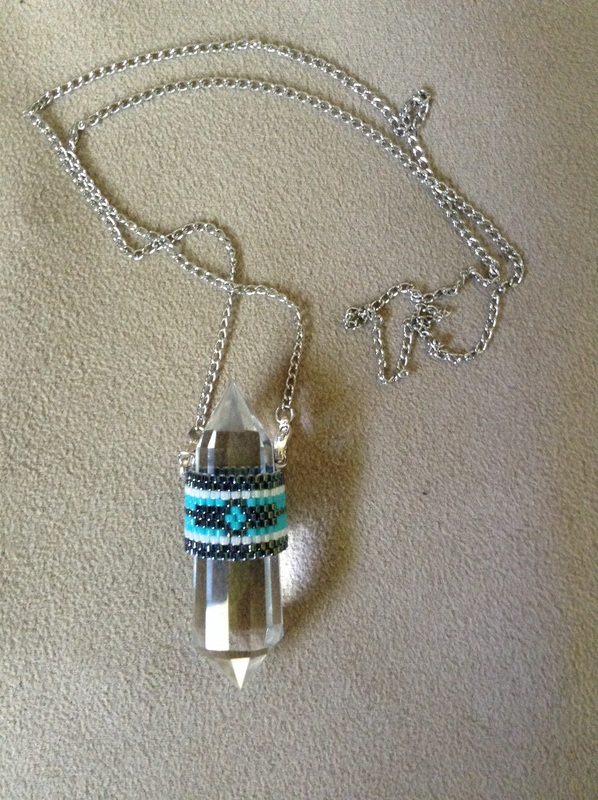 The turquoise, black and white beads create a snug base to hold the crystal. Chain is about 24 inches long. This entry was posted in Uncategorized on September 14, 2015 by dragonflydreamweaver. 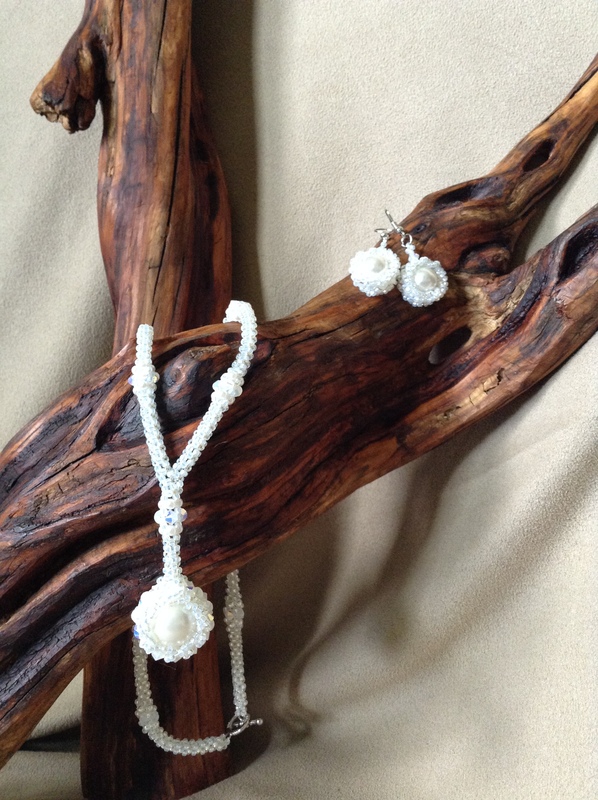 A timeless set in pearls, crystals and silver lined seed beads. Delicate enough to show off your beautiful wedding dress, or little black dress yet stunning enough to receive compliments from those around you. 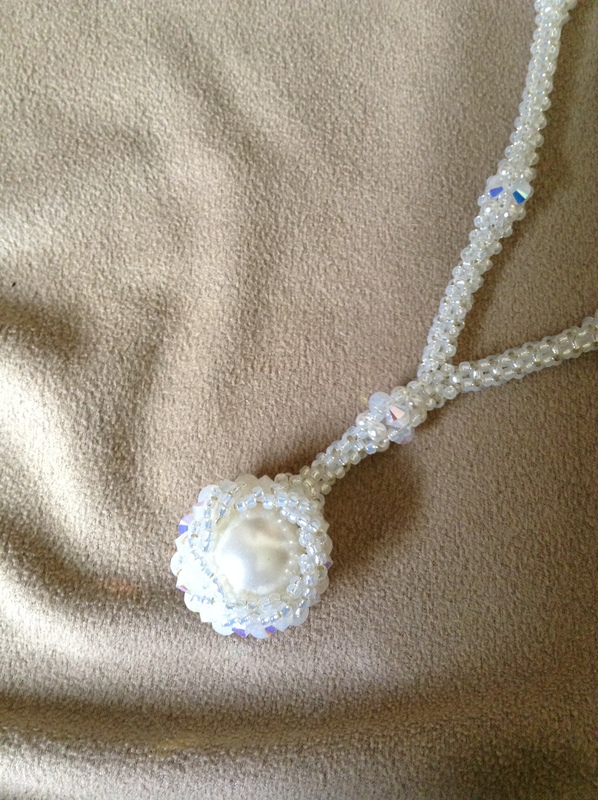 The seed beads swirl around the large central pearl accenting its beauty. 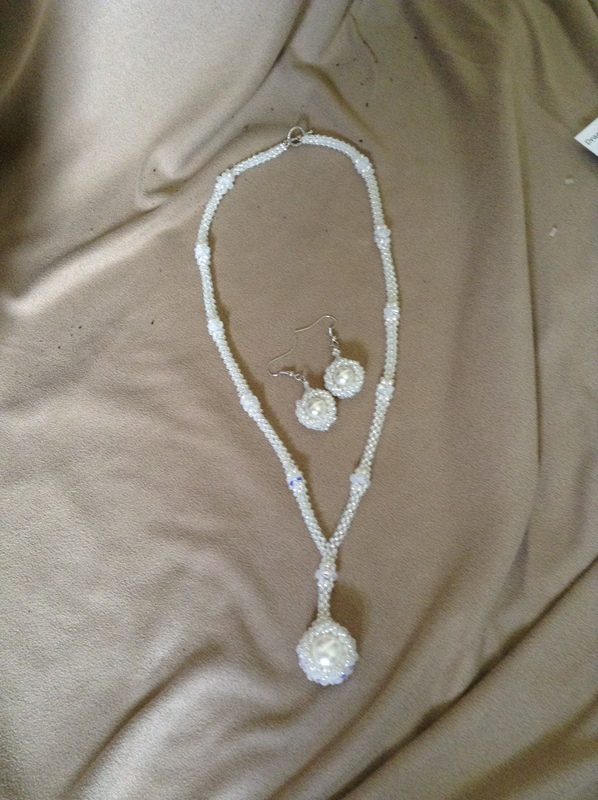 The earrings are small replicas of the necklace. This entry was posted in Uncategorized on August 8, 2015 by dragonflydreamweaver. 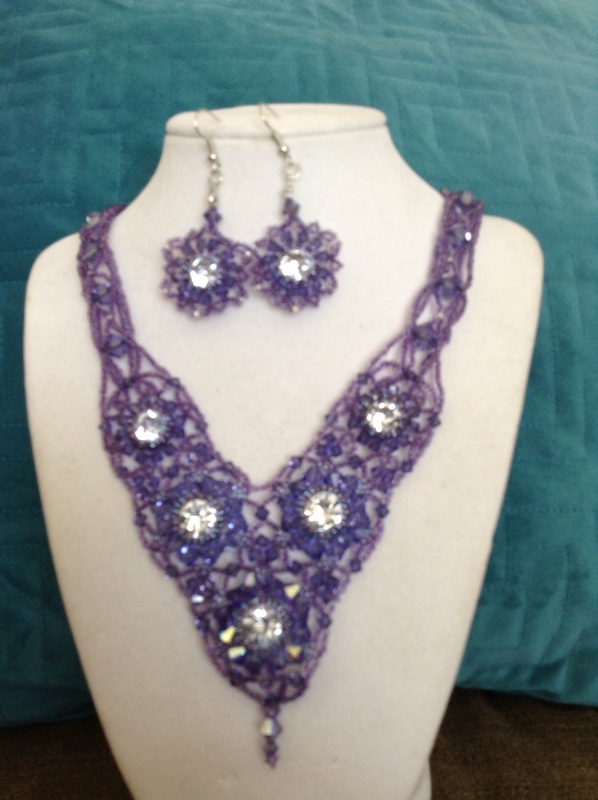 Silver with amethyst swarovski crystals create the perfect floral necklace and earring set. 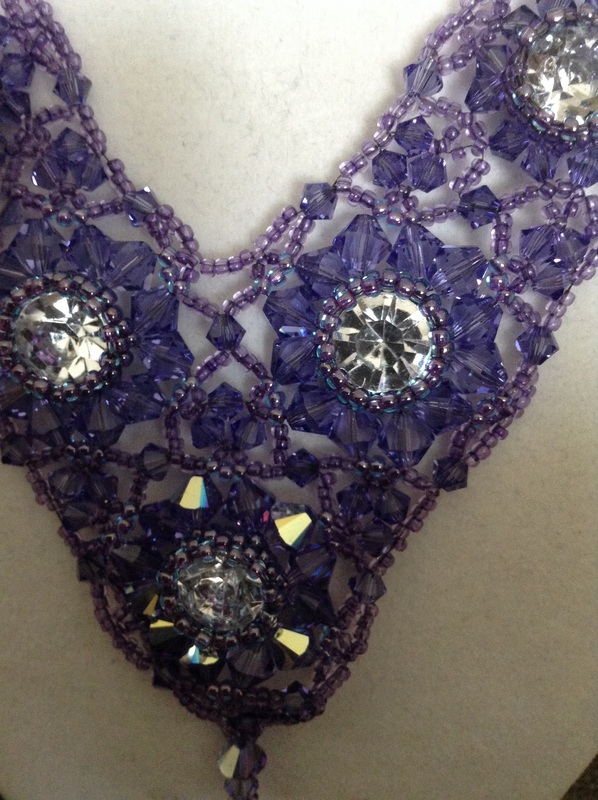 The tiny flowers are gathered together by seed bead webs to create an elegant evening piece. This entry was posted in Uncategorized on July 19, 2015 by dragonflydreamweaver. Lighter Cases are always a popular item. I love watching the colors come together to create a pattern. I am now starting on one created just for my husband. It will have his name somewhere in the design. 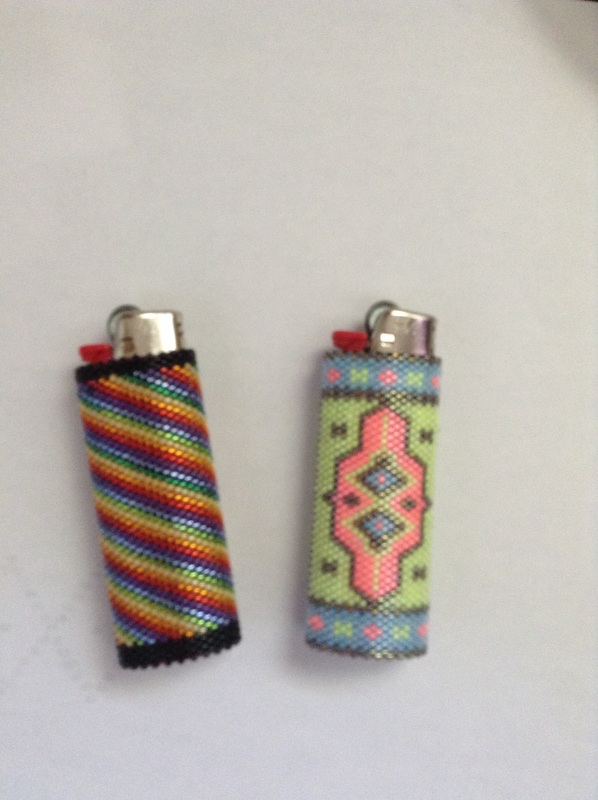 Anyone wishing a handcrafted lighter case, feel free to contact me. This entry was posted in Uncategorized on June 25, 2015 by dragonflydreamweaver.